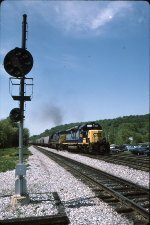 Description: Former L&N 8125 Eastbound thru Point Of Rocks. Headed up old main, Station behind photographer. Description: SD40-2s near Martinez, Ga. at the I-20 overpass. Description: CSX SD40-2 #8125 sits in the pocket at the West Lead of Bayview Yard. Description: Q160 eastbound at Amsterdam station.